Brave and Happy: Puddle Jumper! I love the rain. I also love getting outside right after the rain! One of my favorite things is watching a kid size up a jump across a rain puddle. Toes on the edge, a little bend of the knees and a swing of the arms...and jump! Then the smile! The great thing about this risk-taking leap is that the smile comes whether those feet clear the water or they make a splash! The goal, the plan, and the results take almost no time at all...and end with a smile! The goal was chosen, the effort was made, and the smile came regardless of success! What about a more long-term goal? 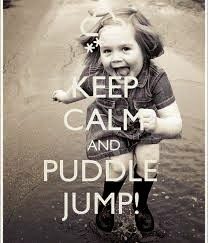 Wouldn't it be great to approach it with the same puddle-jumper attitude!! !